As always, our World Book Day celebrations in the Junior School were a Spring Term highlight, incorporating workshops, book-making, storytelling and a wonderfully creative costume parade. We had some very imaginative outfits including Where’s Wally, Voldemort, Mary Poppins, Wendy from Peter Pan, Horrid Henry, Princess Jasmine from Aladdin and quite a few Harry Potters! 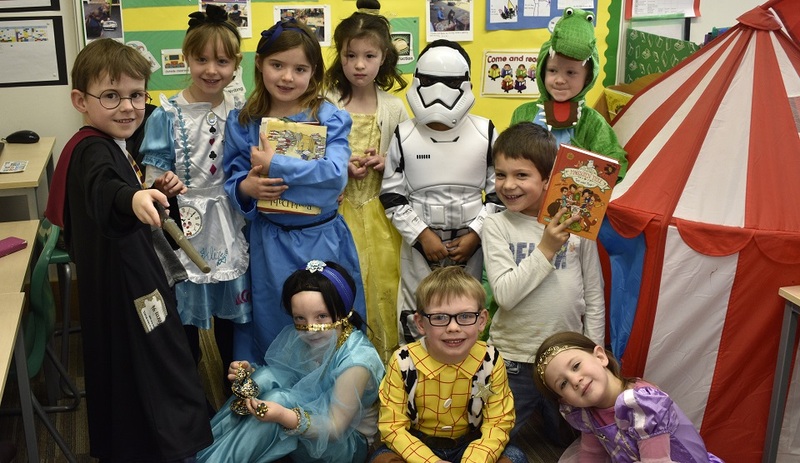 Everyone in Years 1-7 walked a circuit around the room, showing off their creative costumes to parents and friends, before going into class to start a series of World Book Day activities, including trips to Waterstones and Topping’s bookshops. Year 2 welcomed Mrs Inesta-Hernandez for an introduction to bilingual story books and a special reading of Peter Pan in Spanish. Junior and Senior School staff read their favourite books to pupils in ‘story corner’ during break and lunch times, and Mr Lamb led a very dramatic assembly, with a reading of ‘Green Eggs and Ham’ by Dr. Seuss. Year 5 combined World Book Day with Shrove Tuesday, cooking pancakes over the firepit in the outdoor classroom and reading on logs around the fire while they waited for their food to cook. Pupils in Years 5-7 made books from scratch, which they then filled with their own poems, stories and illustrations, and Dr Koenig led a very informative assembly on the work of Book Aid International. Thank you to everyone who donated – a total of £120.00 was raised to support the education and stoking of imaginations through books of children and young people all over the world.